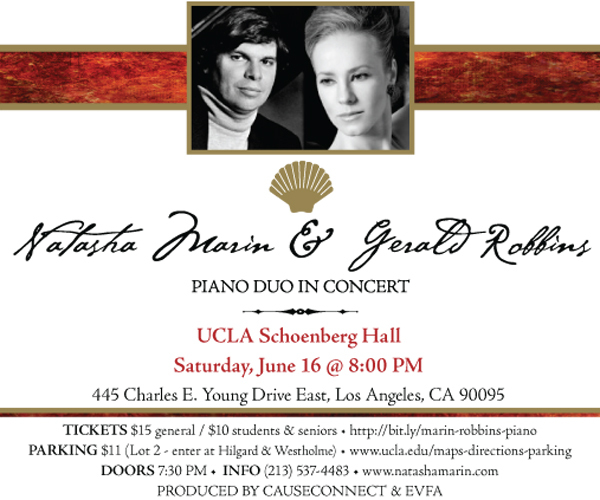 Natasha Marin and Gerald Robbins announce their classical music collaboration, which launches on Saturday, June 16 with a piano duo concert at UCLA Schoenberg Hall in Los Angeles followed by a performance on November 8 at Carnegie Weill Recital Hall in New York. The West Coast premiere showcases works by 19th-century quintessential romantic composers. The hour-long program opens with Anton Arensky (Suite Silhouetten op. 23) and Johannes Brahms (Variations on a Theme by Haydn, op. 56b). After intermission, the performance continues with Sergei Rachmaninoff (Suite No. 2 op. 17) and Camille Saint-Saëns (Variations on a Theme by Beethoven op. 35). Program and ticket information for the East Coast premiere will be released later this summer. Both concerts are produced by CauseConnect and EVFA. This entry was posted	on Wednesday, May 23rd, 2012 at 11:09 pm	and is filed under events, news. You can follow any responses to this entry through the RSS 2.0 feed. Both comments and pings are currently closed.